With a 16megapixel sensor, RAW image capability and an 8fps shooting speed, not to mention full HD movie shooting and a 320fps high speed movie option, the specifications of this camera would not look out of place on a high-end DSLR camera. Compared to its immediate predecessor, the F770EXR the main difference is the inclusion of WiFi functionality to make it possible to send images directly to a smartphone or tablet. Beyond that, the FxxxEXR family resemblance is very strong in this latest release. With such a saturated market in compact cameras, the question is whether Fujifilm looked at all aspects of the camera’s performance or just added some new features to look nice? The last camera from this line tested in the DxOMark labs was the F600EXR launched a year previously and sitting 196th in the sensor ratings with an overall DxOMark score of 40. 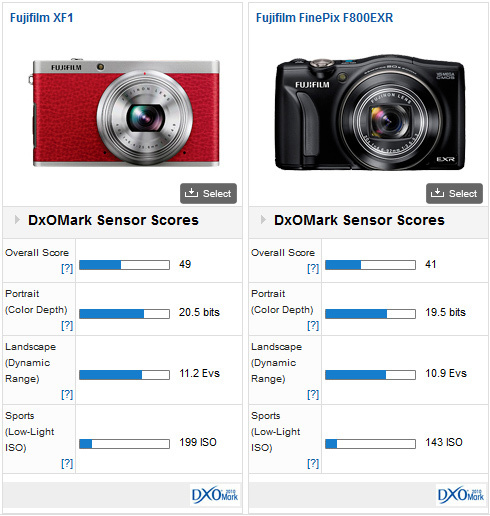 In the intervening year, the F800EXR does climb up the table slightly, making it to 192nd with an overall DxOMark score of 41 – more a small step than major leap. 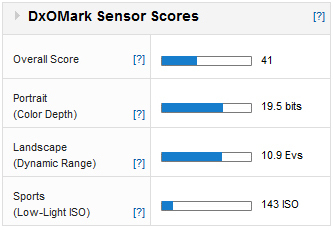 While this may seem disappointing, even a cursory glance at the DxOMark sensor score table above will reveal that despite the relatively low score, it is not poor across the board. In fact, in both the Portrait tests for colour depth and the landscape tests for dynamic range, the F800EXR actually performs very well scoring 19.5bits and 10.9Evs respectively. It is the third test metric that really lets this camera down – the ports tests for low-light ISO performance shows the weakness with a very low score of 143 ISO. While this is actually quite respectable for a compact camera, it points to what this camera could achieve given better ISO capabilities. The reality of this though, is that if you don’t plan on shooting in low light situations, the portrait score and landscape score show it to be a competent performer worthy of further consideration. The Fujifilm XF1 is a slightly higher model than the F800EXR in that it is aimed even further up the market. It offers a lower resolution and smaller zoom range, but more closely fits with the needs of advanced enthusiasts and professional photographers who historically shun the bells and whistles and for whom image quality is paramount. In terms of base specifications, the XF1 gives away 4megapixels in resolution but features a larger sensor so low light performance is expected to be better. A focal range of 25mm-100mm means it has less versatility. However, for the same reason that prime lenses on DSLR cameras usually outperform zoom lenses, you must choose a trade-off between versatility and the associated compromises in design, or outright image quality. And the F800EXR and XF1 are at opposite ends of this spectrum. An overall score of 49 puts the Fujifilm XF1 11 places ahead of the F800EXR in the sensor rankings at 181st compared to 192nd. The improvements in the XF1 are not just confined to one area either – the F800EXR loses out in all areas of the DxOMark tests. In the portrait tests, the XF1 is 2/3rd stop better (20.5bits to 19.5bits). In the landscape tests the scores are closer but the XF1 is still 1/3rd stop better (11.2Evs to 10.9Evs) and it’s the same with the low-light ISO tests, with the XF1 scoring 1/2stop better than the F800EXR (199ISO vs. 143ISO). These differences are almost entirely down to the different design aims of these two cameras, where a larger sensor with a lower resolution was chosen for the XF1, the F800EXR sticks with a smaller sensor and more additional features. 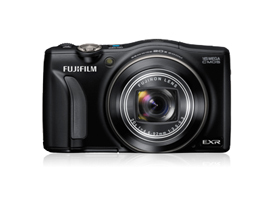 If you are searching for a full-featured compact camera that provides huge versatility in focal range and additional features, the Fujifilm FinePix F800EXR has a lot to recommend it – it will perform very well shooting portraits or landscapes which play to the strengths of the sensor. It is only let down by the relatively poor low-light performance. If however, you are more interested in finding a compact with the highest image quality across the board, then there are better options available though they tend to lack the versatile nature of this camera.